You’ve just finished your new Python module. You can’t wait to upload it to the Web and let all the other Python hackers start using it. The only step left is the most dreaded for many programmers: documentation. Unless you’ve been commenting and documenting your code as you wrote it, you’re going to have to go back through each source file, class, and function, trying to remember exactly what your code was supposed to do. Not an enjoyable task. Sound familiar to you? If it does, you’re probably not using documentation strings, commonly known as doc strings or docstrings (I prefer docstrings, without the space), or any of the handy tools that work with docstrings. This article will introduce you to Python’s docstrings, and a few of the tools that make them a great addition to your code. If you are not already using docstrings in your Python code, you really should. They provide a standard way to comment your code, giving you and other developers (who might want to use your code at some point) easy access to descriptions of the modules, classes, and functions found within. At the heart of it, docstrings are simply comments placed in special locations in your Python source code. These comments can then be looked at by tools designed to work with docstrings or other Python programmers using your code. Note that I said using// your code, not reading your code. This is because docstrings are accessible via a Python object’s __doc__ attribute. This is very helpful is you are testing out a new module in Python’s interactive shell and really need to know what sort of parameters a certain function needs. “””This is the subtract function’s docstring. Since docstrings are comments they can be in any format that you want, however since this is Python there are a few style guidelines that you should probably be aware of. You don’t have to follow these guidlines but if you do it will be easier for other Python programmers to understand and work with your code. In general there are two types of docstrings: one-line docstrings and multi-line docstrings. The difference between the two should be fairly obvious: one-line docstrings are only one line in length and multi-line docstrings are more then one line in length. One-line docstrings and multi-line docstrings each have different style guidelines that will be explained in more detail in the following two sections. There’s no blank line either before or after the doc string. One-line docstrings should only be used to document the simplest of cases. If what you are documenting does anything complicated, accepts input, or returns a value, it’s probably a good idea to use a multi-line docstring. Multi-line docstrings should be used to document the majority of your modules, classes, functions, and methods. This is because most of what you are programming performs tasks more complicated then that which can fit into a single sentence summary. Multi-line docstrings should be used to documents the input, output, and complex behaviour of your objects. Like one-line docstrings, multi-line docstrings should start with a single sentence summary. After that there should be a blank line and then a more detailed description. The blank line separating the one line summary and the additional information is important as certain tools will use the blank line to separate the summary from the rest of the docstring. An example of a multi-line comment can be found in Listing 1. “””Return the difference between two numbers. There are also style guidelines that dictate what you should include in your multi-line docstrings when documenting different sections of your code. These are general guidelines but following them will help ensure that your code is well documented and easily understood by other Python programmers. For more information on this please see Guido’s “Python Style Guide”. Modules – Document the module and provide a one line summary of everything that is exported by the module. (eg. classes, exceptions, and functions). Classes – Summarize the functionality of the class. List all public methods and data members of the class. If there is any addition information needed to subclass the class, or if there is an additional interface for subclasses provide a description. An example of all of these can be found in Listing 2. Math — A simple math class with mathematical functions. “””A simple math class with mathematical functions. “””Return the sum of two numbers. x — Number to be summed. y — Number to be summed. Generally if you have a complicated module or API people would rather read a help file, or online documentation, as opposed to constantly having find and browse the source code. Thankfully for us there are many different documentation generation tools out there that make use of docstrings. So when you are writing your docstrings, you aren’t just commenting your source code you’re also writing your help file! The easiest tool to use is PyDoc, it’s a module, and a stand-alone application, that has been included in the Python standard library since version 2.1. There is much that can be done with PyDoc but for this column we are going to focus on it’s documentation generation. PyDoc can take the docstrings found within a module and output them as either simple text documentation (much like UNIX or Linux man pages) or HTML documentation. This will create an HTML file named SimpleMath.html in the current folder. A sample of what the generated HTML looks like can be seen in Figure 1. While PyDoc is a great tool and easy to use because it is in the standard library, there are a few other tools out there that you might consider using. If you look at the HTML file that PyDoc generates you will notice that it does not mark up your docstrings. It simply reads them from your source code and spits them back out. If you are looking for something a little bit fancier with a few more options you might consider Epydoc or docutils. Both Epydoc and docutils use simple markup languages to give the documentation generated a bit more punch. Docutils uses the reStructuredText markup language. While Epydoc uses the Epytext markup language, as well as being able to work with Javadoc and reStructuredText. An example of the HTML that Epydoc produces can be seen in Figure 2. The code that was used to generate the HTML can be found in Listing 3. @param x: Number to be summed. @param y: Number to be summed. One of the most interesting uses of docstrings is unit testing using the doctest module. As we all know testing our code is important, and (as many of us have begun to learn) writing unit tests for large projects is a great way to ensure that changes in one area of a project don’t cause problems elsewhere in the code. If you don’t know what a unit test is it’s basically a simple test case to prove whether a specific area of your code is functioning properly. Generally at least one unit test is created for each object in order to test the correctness of the project as a whole. In a nutshell the the doctest module searches your dostrings "for pieces of text that look like interactive Python sessions, and then executes those sessions to verify that they work exactly as shown." This means that it will search your docstrings for lines that start with >>> or with ... if they are the continuation of a statement (i.e. the inside of a function). If there is output generated by the statements it “must immediately follow the final ‘>>> ‘ or ‘… ‘ line containing the code, and … extends to the next ‘>>> ‘ or all-whitespace line.” Adding doctests doesn’t just add unit tests to your code it also provides working examples in your docstrings and documentation. 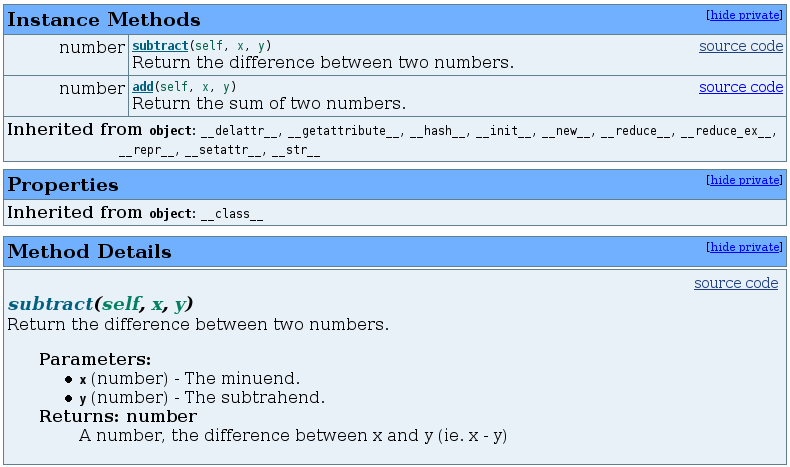 As you can see, what we have here is a test compromising of two lines of Python code and then the expected result. 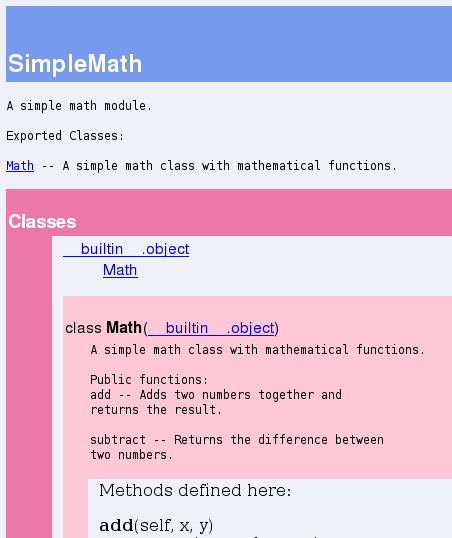 The SimpleMath module containing a doctest for each function can be found in Listing 4. If you were to encounter an error it would look something like Listing 5. As an added bonus if you are using Epydoc or docutils to generate your documentation, both tools will recognize doctest sections and highlight them. An example of what it looks like when Epydoc does this can be seen in Figure 3. Hopefully by this point you can see how useful docstrings can be to any Python code that you write. They give you a structured way to document your source code, the ability to easily generate great looking documentation, and a simple way to add unit tests to your code. But that's not all, as more and more people start using doctrings you can be sure that the list of docstring tools will continue to grow. We all know that commenting source code and writing documentation are among the least enjoyable tasks a programmer can face. In fact the only thing worse then commenting and documenting is trying to use code with no comments and poor documentation! So do me, and yourself, a favour: start writing those docstrings. This article is out of date. Sphinx (http://sphinx.pocoo.org/), the best tool to generate documentation from docstrings, is not mentioned at all. It is widely used today. Good point. This article is almost 2 years old but I thought that a few people might make use of it. If I have the time I’ll add a section on Sphinx. Nice article .. docstrings beginning to end .. good job walking the uninitiated through the what’s and why’s. Does anyone know if there are similar standards / tools for C/C++? 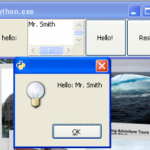 Or extensions of Python tools to cover mixed language development? Previous Previous post: Iterators, Iterables, and Generators! Oh, my!